Leinster have announced 18 re-signings ahead of next season and the capture of two new forwards. With Gordon D'Arcy one of the 18, Leinster have also tied down star back Isa Nacewa on a new one-year contract. He is joined on new deals by Ireland internationals Kevin McLaughlin, Isaac Boss, Eoin Reddan and Rhys Ruddock. However there is no Luke Fitzgerald on the list with question marks still surrounding his future. Leinster skipper Leo Cullen has also penned a new deal. Other new re-signings include Fionn Carr, John Cooney, Brendan Macken and Heinke van der Merwe. In addition, the club have also unveiled two new signings. Leeds second-row Tom Denton and tight-head Michael Bent have both opted to switch to the Heineken Cup champions ahead of next season. Coach Joe Schmidt will now start preparing his side for their second Heineken Cup final in as many seasons and he is delighted with the host of re-signings. "The process of recruitment can be quite drawn out, but we are delighted to announce these new extensions as well as welcoming Michael and Tom, who are two highly rated forwards who will add to the competitiveness in our pack over the coming season," Schmidt said. "There is a welcome mix of home-grown youth and experienced players amongst this batch of renewals, while we are delighted to announce extensions for Isa [Nacewa] and Heinke [van der Merwe] who have both contributed a significant amount on and off the field of play since their arrival." The Irish Rugby Football Union also moved to confirm that Nacewa's renewal was in line with their 'non eligible player policy framework'. The new rules state that over Ulster, Munster and Leinster, there must be only one overseas player in each position across the three provinces. 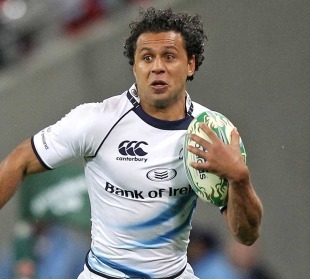 Their CEO Philip Browne added: "Following on from what has been a truly phenomenal weekend for Irish rugby the re-signing of Isa Nacewa by Leinster is a very positive move and one that is very much welcomed by the IRFU. "While we are absolutely committed to the primacy of The National Team, something that all of the provinces agree with, the PCRG [Professional Contracts Review Group] will continue to show discretion on the management of the policy when working with, and supporting, our Provinces in their quest for ongoing success in the RaboDirect PRO 12 and Heineken Cup."